$70.885 million on -unknown- screens. Back in 2005, the big-screen adaptation of Frank Miller’s Sin City became a moderate hit. Actually, I think it qualifies most as a cult fave and not something that reached a true mass audience. The movie’s $74 million take certainly is decent, but it doesn’t seem special in this day and age. On the other hand, 2007 brought a Miller adaptation with much broader mass appeal. 300 became the year’s first really big hit. With its $210 million gross, it turned into a surprise smash. Based loosely on historical events, we go back to the BC years for 300. 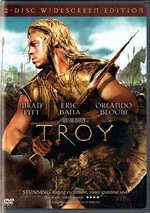 Persian King Xerxes (Rodrigo Santoro) demands that Spartan King Leonidas (Gerard Butler) kneel before him – and by connection commit Sparta to Persian rule. Leonidas refuses to do so. Though the Persian forces outnumber his by roughly one million to 300, Leonidas leads his men to battle. Much mayhem ensues. Those who seek more plot in 300 shouldn’t hold out any hope. Oh, the movie throws out a little intrigue back home between Queen Gorgo (Lena Headey) and traitorous Theron (Dominic West), but those elements go virtually nowhere. The focus remains on Leonidas and his dudes as they hack and slash through the Persians. If you’ve ever watched someone else as they play a videogame, you’ll know what to expect from 300. This isn’t a movie as much as it is a collection of action sequences. The narrative ties the events together in only the most loose of all possible ways. This is less a story and more a series of videogame “levels”. I think it gets tiresome to refer to certain movies as triumphs of style over substance, but that cliché truly applies to 300. Director Zack Snyder clearly could not care less about such trivialities as story and characters. He cares about the way the film looks and that’s it. Everything else becomes irrelevant to Snyder, as even Leonidas receives nothing more than rudimentary character depth. Snyder nods vaguely in that direction but we still know – or care – little about the protagonist. This means 300 looks like a compilation reel of Lord of the Rings fight scenes. Not much happens other than the battles, as we ricochet from one to another with little substance to fill the gaps. Snyder just makes this a “greatest hits” compilation of the Spartan’s baddest brawls and hopes that we love all the mayhem. Apparently a lot of people do dig the non-stop action, but I don’t. Indeed, I think the incessant emphasis on fight scenes robs 300 of any drama, urgency or excitement. It’s like a meal that consists of 20 candy bars. They’re good in small doses but don’t satisfy when taken to such extremes. Because of this, 300 becomes… dull. With one fight after another, the film seems tedious and repetitive. Maybe the first battle or two comes across as moderately interesting, but the movie quickly enters “enough already!” territory. Snyder’s techniques make things worse. The fetishistic violence annoys more than it sickens, but irritate it does. Snyder films all of the gore in a rather loving way that also robs the material of any impact. Oh, and he chooses to use slow-motion all the time. I reckon that if the whole movie ran at normal speed, it’d probably last about 12 minutes. Maybe Snyder thinks we need the slow-motion to expand his feeble, slight narrative into feature length, and he might be right. There’s certainly not enough substance to fill out almost two hours of screen time. 300 comes with some of the worst, most cliché dialogue I’ve ever heard. We can usually complete statements before the characters get there since we’ve heard so many of them already. Basically, take the “rallying the troops” speech from Braveheart and repeat it over and over; that’ll give you some clue of the insipid lines heard here. The film forces the performers to overact this material to a laughable extreme. In 300, the actors declaim the lines with the overwrought force you’d expect to find in a bad high school rendition of Shakespeare. This factor makes it even more impossible to view the film as anything other than a campy piece of schlock. I respect Frank Miller and I actually liked Snyder’s Dawn of the Dead remake. I wanted – and expected – to enjoy 300. However, the film ended up as an enormous disappointment. It’s nothing more than a two-hour videogame demo released as a feature flick. 300 appears in an aspect ratio of approximately 2.35:1 on this single-sided, double-layered DVD; the image has been enhanced for 16X9 televisions. Across the board, the transfer satisfied. Sharpness always looked good. From start to finish, I thought it appeared crisp and concise, with virtually no instances of softness to distract. The image lacked jagged edges or shimmering, and edge enhancement appeared to be absent. In terms of source flaws, the movie often looked grainy, but this occurred due to stylistic choices; the grain appeared during theatrical screenings as well and was supposed to be there. Otherwise the flick lacked any defects. Another stylistic choice affected the colors of 300. Essentially, the movie came devoid of most hues, as it often favored either a mild golden tint or a chilly blue tone. Occasionally I saw slightly warmer colors like some rich reds, but those were rare. Within the film’s design, the hues looked solid. Blacks were deep and dense, while shadows seemed clear and smooth. This was a solid visual presentation. In addition, 300 boasted an excellent Dolby Digital 5.1 soundtrack. Like the movie itself, this was a constant assault on the senses, and it added serious punch to the piece. The soundfield used all five speakers to terrific advantage, especially during the battles. All the elements of war swarmed around us and created a fine sense of the setting. Even quieter scenes – which filled about three minutes of this aggressive film – still offered good ambient information. This was a powerful soundfield that placed its pieces well and combined them to work well. Audio quality also was positive. Despite a lot of looped lines, speech remained natural and concise, with no edginess or other problems. Music was dynamic and full, while effects seemed strong. Those elements produced good punch and lacked distortion. They seemed accurate and tight, and the movie featured excellent low-end response. This was a demonstration worthy soundtrack. 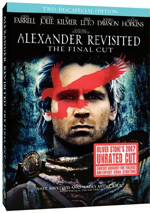 In terms of extras, this two-disc Special Edition begins with an audio commentary on DVD One. We find a running, screen-specific track with director Zack Snyder, writer Kurt Johnstad and director of photography Larry Fong. All three sit together for this piece, though Snyder heavily dominates the proceedings. 95 percent of the chat sticks with three subjects: visual effects, sets – or the lack thereof – and comparisons with the original graphic novel. Occasionally we hear about things like the actors, stunts, and action, but those subjects pop up infrequently. Instead, we get incessant remarks about the digital sets and other banal issues. Even the notes about the adaptation tend to consist of little more than “this shot’s from the graphic novel”. Lots of dead air appears in this dull, frustrating commentary. A few ads open DVD One. We get promos for Trick ‘r Treat, The Brave One, Superman: Doomsday, Gametap, the 300: March to Glory videogame and the 300 soundtrack. 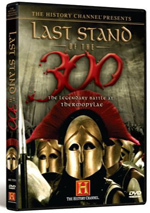 When we shift to DVD Two, we begin with The 300 – Fact or Fiction?. This 24-minute and 32-second program mixes movie clips, behind the scenes bits, and interviews. We hear from Snyder, authors/historians Bettany Hughes and Dr. Victor Davis Hanson, writer/executive producer Frank Miller, and actor Gerard Butler. The show includes some historical notes about the Spartans and comparisons between those facts and the movie’s fiction. We also learn about Miller’s graphic novel and its film adaptation. All those factors combine well in this pretty enjoyable piece. 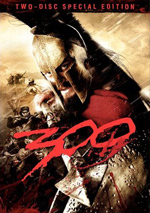 It manages to give us a nice examination of how 300 fits with history and fleshes out those facts to a satisfying degree. It should help expand fans’ enjoyment of the film since it broadens their understanding of the material at hand. Oh, and it helps that Hughes is a serious babe! For more historical information, we find the four-minute and 24-second Who Were the Spartans? The Warriors of 300. It features Snyder, Miller, Butler, Hanson, Hughes, and actors Rodrigo Santoro, and David Wenham. “Warriors” expands on “Fact” as it examines the culture of the Spartans and their society. It’s not as good as “Fact”, but it offers a decent addition to the set. Next we discover The Frank Miller Tapes. This 14-minute and 31-second piece offers remarks from Snyder, Miller, DC Comic president/publisher Paul Levitz, comic book creator Neal Adams, and DC Comics group editor Bob Schreck. “Tapes” looks at Miller’s start in comics, his development, his influences, and his work on 300. This becomes an enjoyable view of Miller, though it disappoints due to its essential focus on 300. While we get some insights into Miller’s processes and goals, I’d have liked something that took a broader look at his career to better put 300 in context. Nonetheless, “Tapes” works pretty well for what it is. Making of 300 goes for five minutes, 47 seconds and presents remarks from Snyder, Miller, Butler, Johnstad, visual effects supervisor Chris Watts, Spartan trainer Mark Twight and actor Lena Headey, This promotional piece mostly tells us the movie’s story along with some quick notes about its visual style and the actors’ physical training. It offers exceedingly little substance; you won’t miss anything if you skip it. A different view of the film’s creation comes from the three-minute and 34-second Making 300 In Images. This provides a visual montage of photos and video fooahe from the 300 set accompanied by music. We see the various elements but they come devoid of context and fly by at a ridiculous rate. Some potentially intriguing bits appear here but they’re robbed of substance and add little to our understanding of the film and its creation. Three Deleted Scenes fill a total of three minutes, 21 seconds. That running time includes non-optional introductions with Snyder. The first two show a little more of Ephialtes, while the third offers some more action with midget archers. They’re all pretty silly. In his intros, Snyder explains why he cut them. Originally shown on the Internet, 12 Webisodes go for a total of 38 minutes, 20 seconds. These present remarks from Snyder, Headey, Butler, Santoro, Miller, Johnstad, Twight, Wenham, Watts, production designer Jim Bissell, costume designer Michael Wilkinson, stunt coordinator/fight choreographer Damon Caro, assistant stunt coordinator/assistant fight choreographer Chad Stahelski, creature shop supervisor Mark Rappaport, special effects makeup supervisor Shaun Smith, and actors Vincent Regan and Dominic West. Quick promotional bits, these look at production design, wardrobe, stunts, the graphic novel’s adaptation, the actors, their characters and their training, visual effects, and some aspects of Spartan culture. Even though the “Webisodes” clearly exist for publicity purposes, they still often manage to provide good information. The first three “Webisodes” deal with production design, wardrobe and stunts, and those prove especially valuable. I also like the ones that check out visual effects, training, makeup and characters. Most of the others tend to be somewhat fluffy, but all remain enjoyable. The “Webisodes” are probably the best extras found in this set. More ads show up at the start of DVD Two. We get a promotion for WB’s hi-def releases as well as a preview of the upcoming Blade Runner 25th Anniversary Edition and NHL DVDs. Possibly the biggest cinematic disappointment we’ll see in 2007, 300 takes an interesting premise and turns the material into laughable schlock. I feel absolutely perplexed that this ripe cheese maintains such a big audience of folks who love it, though I’ll go out on a limb and opine that they’ll be embarrassed of it within the next 10 years. This is a terrible piece of overacted, overwrought and over-dramatic action trash. As for the DVD, it offered very strong picture and audio. The extras are hit or miss. We find some good historical notes and the “Webisodes” flesh out a variety of production issues, but the commentary is a complete bore and the other behind the scenes pieces remain superficial. Kind of like 300 itself. Fans of the movie should like this DVD; although its supplements fall short of expectations, it delivers the film well. Too bad that flick is such an inane, overdone piece of fluff.